This beautiful Izannah Walker inspired doll made by doll maker Peggy Flavin is on Ebay right now. I love this doll for so many reasons! It's obvious she has really studied original Izannah Walker dolls - it shows in her sculpt. But the other reason I love this sweet girl is because it's made with my Izannah Walker inspired pattern. I feel honored that someone used my pattern, and thrilled that they created a doll that evokes Izannah Walker's work so closely. Hand-sculpted over cloth doll. Truly a one of a kind beauty. Visit the auction page for more information. 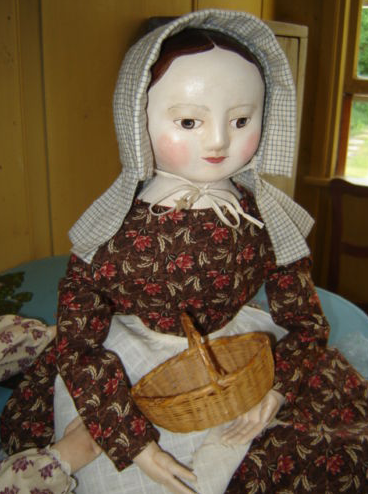 Later note....Peggy's doll auction ended at $751.99 and is well deserved.